So I decided to do a ’round-up’ of my favorite products each month/season, depending on which boxes I receive and how busy I am. Hopefully I’ll be able to keep this up either every month, or worst case, every 3 months. 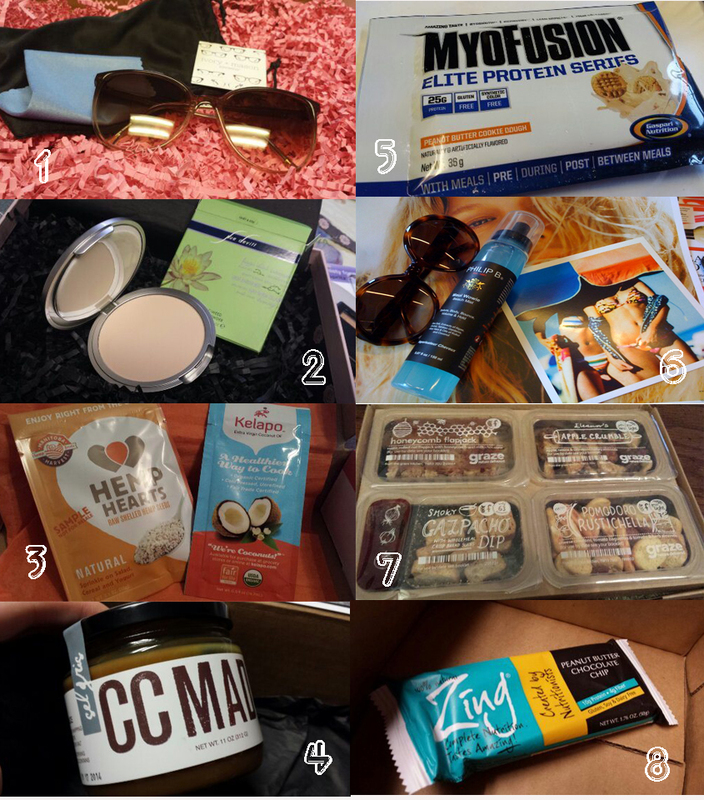 So here’s my haul of faves for August… can anyone else agree/disagree? My favorites from top to bottom, left to right: 1. Ivory + Mason Sunglasses from FabFitFun VIP Box, 2. Sue Devitt C-Weed Face Powder from GlossyBox, 3. Kelapo Coconut Oil from both BuluBox and Cloud9 Sample Box, 4. CC Made Salted Caramel Sauce from Taste Trunk, 5. Myofusion Peanut Butter Cookie Dough Protein Powder from JackedPack, 6. Phillip B. Sea Surf Hair Spray from Blush Mystery Box, 7. My Amazing Goodies such as Pomodoro Rustichella and Apple Crumble from Graze, and finally the 8. Zing Peanut Butter Chocolate Chip (heavenly) protein bar from FitBox by PlatinumBox.